The air now website shows air quality in the state. 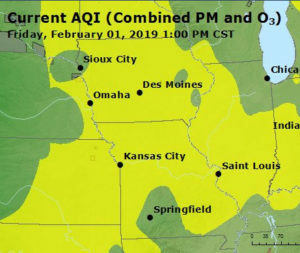 The forecast for warmer temperatures Sunday that will melt snow could lead to fog that makes the air quality drop in some areas of the state. DNR air quality specialist John Gering, says we could see a combination of things that lead to the problem. “The water droplets resulting from the higher humidity can kind of accelerate the reaction of fine particulates — particularly ammonium nitrate,” Gering says. He says the ammonium nitrate that’s created and trapped in the air could cause breathing problems for some individuals. “People with respiratory or heart disease, the elderly and children, would be advised to limit outdoor exertion,” according to Gering. You can see what the air quality is like in your area by going to www.airnow.gov. “That would kind of give you a color-coded indication of what the levels are,” according the Gering. “If they reach the orange color — that would be an indication of unhealthy levels for sensitive groups.” Gering says everyone should be aware of the potential for the dirty air. He says temperatures are going to be between freezing throughout the whole day, so this has the potential to be an issue statewide. The forecast is calling for temperatures to rise into the 40’s Saturday, and then continue to heat up in to the 50’s on Sunday. The ammonia in the air comes from decaying vegetation and animal feeding operations, and the nitrates come from vehicle exhaust and other sources.